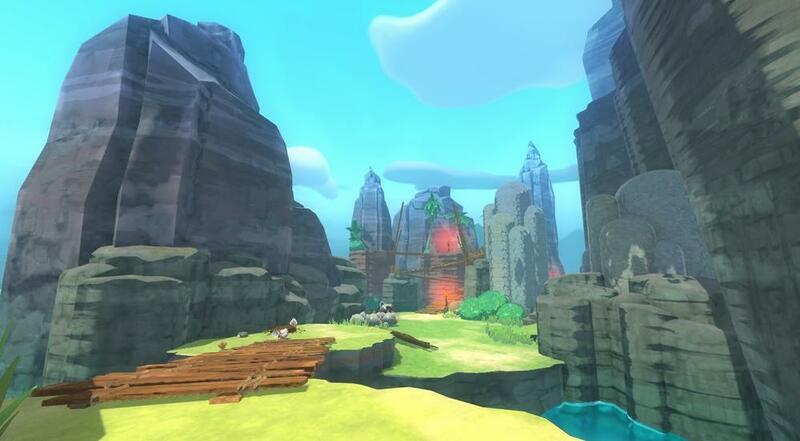 Everything you could possibly want to know about The Wilds. This guide contains everything from how to unlock it, to how to tame sabers. You must have The Overgrowth expansion in your ranch. You must have unlocked the Moss Blanket area in the world. 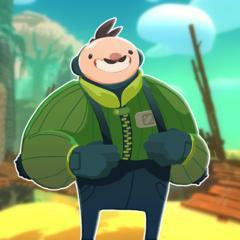 After you complete his trade, you will receive a Starmail from him. Upon reading the starmail, a teleporter infront of The Overgrowth will have unlocked. Going through it will teleport you to Ogden's Retreat. There will be a Range Exchange machine there, and after activating it, a teleporter to your right will unlock. Going through it will result in you arrival in The Wilds. 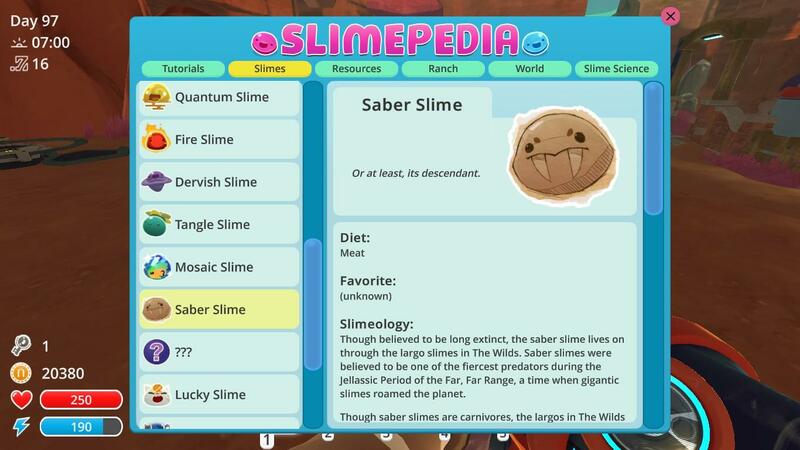 In The Wilds, live an ancient type of slime known as the Saber Slime. You will not be able to find a regular Saber Slime, because they only spawn as largos of other slimes, and like Feral Slimes, are ready to take a bite out of anything infront of them, including ranchers! 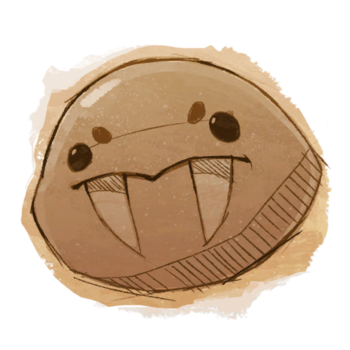 Though, also like Feral Slimes, they can be tamed by feeding them food, particulary meat, because all Sabers eat meat. 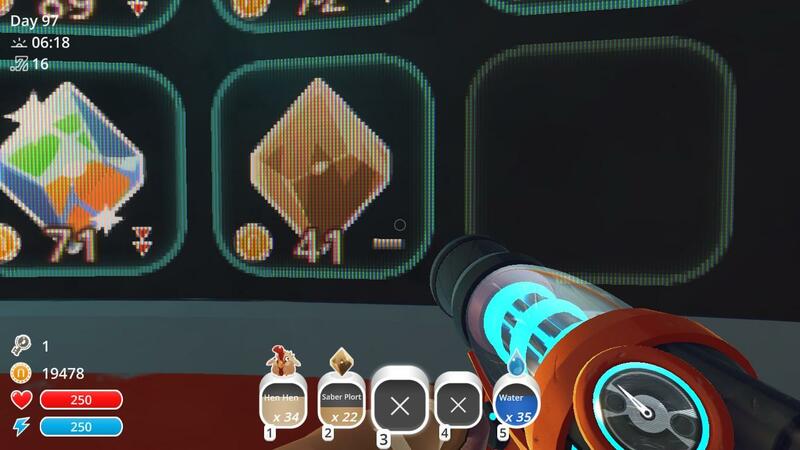 I also recomend collecting the saber plorts after feeding them, as they are worth a fair bit at the Plort Market. I'm not saying their the most valuble, but they do give you about 40 - 50 Newbucks. Heath - Saber Slimes can hit like a truck, upgrade it to at least 200. Energy - You'l need to move fast if you want to outrun Sabers, get at least 200. Jetpack - There are many areas that are only accessible with a jetpack, also get the upgrade that uses less energy. 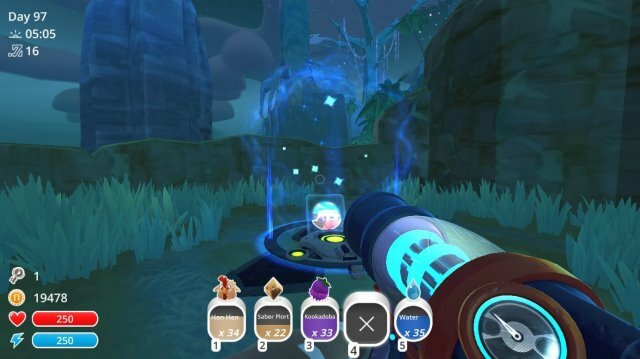 Water Tank - There are alot of oppertunities for Tarr to spawn, also refill your tank whenever possible. 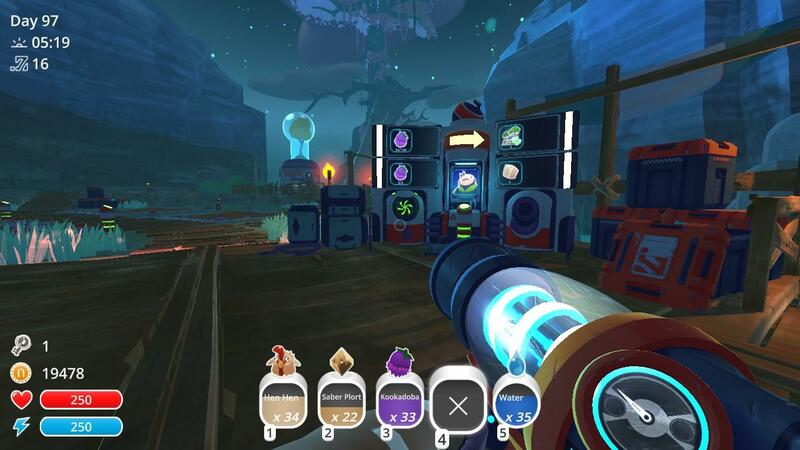 Storage - There are alot of valubles out in The Wilds, get at least up to 40 items per slot. 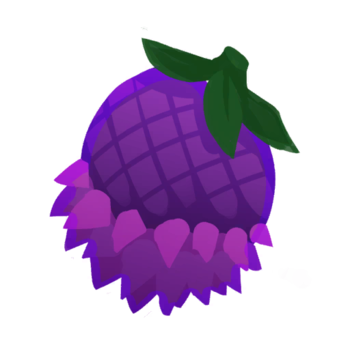 Your job (As explained in the Range Exchange), is to collect the Kookadoba Fruit that naturaly grows in The Wilds. They grow on little nest like bushes that are practically impossible to miss. 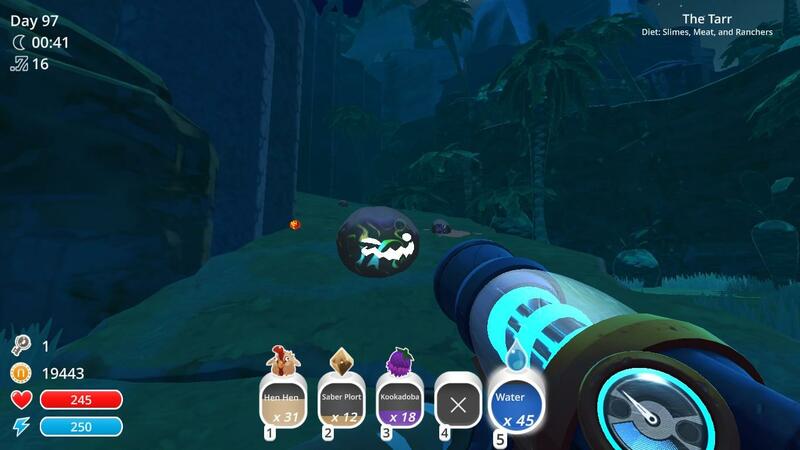 The Saber Slimes have a habit of rolling the Kookadobas into muudballs that are almost unbreakable. Luckily there are a bunch of Ogden's nifty machines that when you shoot a mudball into it, it will break, spitting out all the Kookadobas. They do go quite a distance, so I recomend using your vac while it's breaking it, so when the mudball breaks they go right into your inventory. 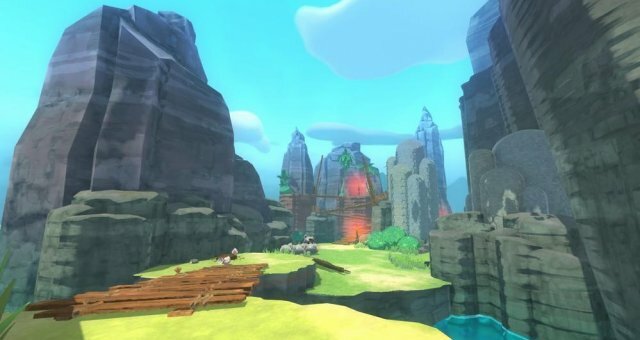 Back at the retreat, you can trade in your Kookadobas at the Range Exchange machine, every 3 gets you a Spicy Tofu, and if you collect enough, you can unlock ranch upgrades. Though you can sort your inventory any way you want, this inventory layout optimises your experiences and allows space for more stuff. 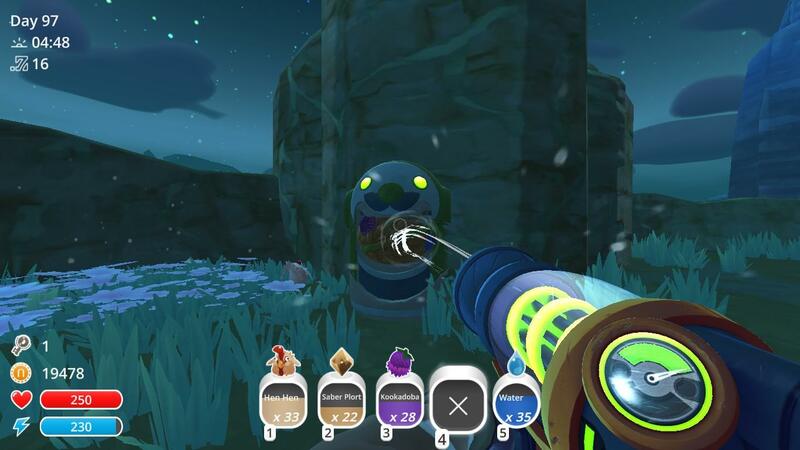 As I said earlier, Saber Slimes can be tamed by feeding them. To combat with any largo type, I recomend having a spare stack of chickens in your silo, and to take them out every time you go to The Wilds. Leave 2 inventory slots open for Kookadobas and Saber Slime Plorts, and the other one leave open, because there are quite a few items required for Slime Science that can spawn in The Wilds. After a visit to The Wilds, your inventory should look like this, if you use this recomendation. 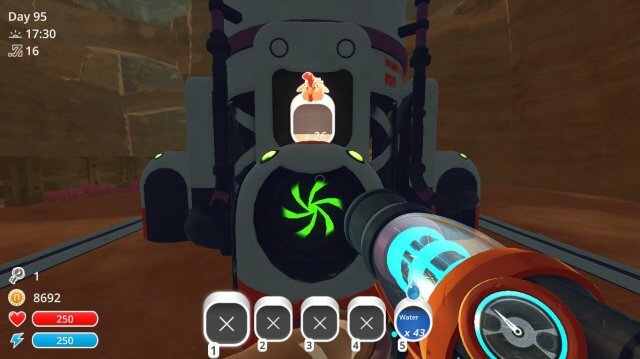 Spicy Tofu can be fed to Pink Slimes, as it is still technically a food. There is a toy that calms Saber Slimes, but I don't know why it's nessesary because you can't bring objects into a teleporter. 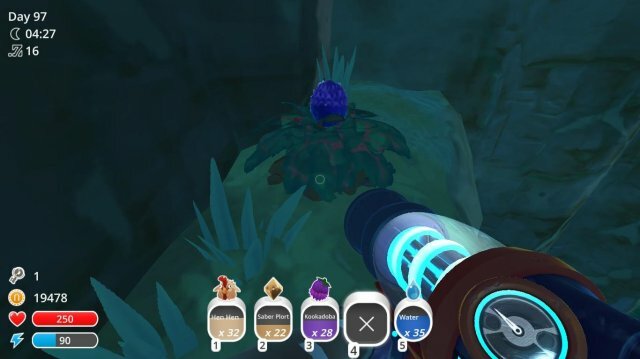 As said earlier, Tarr spawns alot in The Wilds, due to there only being largos in The Wilds, but you should know how to deal with them by now, so here's a photo of them in The Wilds Naturally.